About Mary Ellen O’Toole, Ph.D. Many people have misconceptions about what it’s like to be an FBI profiler. What follows are some of the questions people tend to ask me, along with my answers. Q: What led you to this career choice? Why did you decide to study these very dangerous people? A: I am passionate about human behavior, particularly aberrant or criminal behavior and why people engage in it. From the time I was in grade school, I would wonder what goes through someone’s head when they are in the act of committing murder. I have always been interested in people and human behavior and why people do what they do. Q: Did the career ever get to you? On TV, the profilers are always suffering from alcoholism and other addictions because the job is too stressful. Did you ever want to quit? A: I absolutely loved being an FBI profiler. It was my dream job. My career choice never got to me. I couldn’t get enough of the work. I would think about my cases when I wasn’t working, when I was on vacation, or when I was driving to the store. I was always thinking: How did he get inside the house? How did the offender get access to the child? What did he say to the victim that would have convinced her to go with him? I was motivated by the intricacies of human behavior and the development of violence. Q: How did you avoid getting case hardened? A: I approached my work perhaps as an emergency room doctor would approach that profession. An ER doctor sees life-threatening injuries on a daily basis, but is able to suspend his personal reaction to these injuries as well as use his medical skills and expertise to diagnose and understand what happened and how to treat the person. The ER doctor is passionate about his craft. It is this passion that allows me to suspend my own personal reaction for the greater good of helping to solve a murder and conduct a successful interview. Q: Did your job ever make you afraid for your life? A: No, it didn’t, even though there were moments when my life might have been in danger. For instance, I once interviewed a kidnapping suspect late at night while we were seated on a headstone in a cemetery. I was wearing a wire, but it was not working properly and I’d lost contact with my FBI support team. I was alone with an unrestrained and possibly dangerous man, but I was not scared. Another time, I interviewed a convicted serial killer in prison. His wrists were not cuffed and we were alone in the room together. He repeatedly mentioned how easily he could reach across the table and strangle me to death before anyone could come to my aid. The only time I was frightened during my career was just after 9/11 when I needed to take a flight to interview a serial killer known as the “Toy Box killer.” It was right after the planes were in the air again. On my way to the airport, I pulled off to the side of the road. I had my gun. I had every bullet I owned. I had a retractable baton. I was loaded with weapons—all of which I would be taking with me onto the plane. It was legal for me to fly armed as an FBI agent, and the airlines were aware of who I was because of the necessary paperwork I had to complete each time I flew. Q: What is it like to be sitting across the table from a serial killer? A: It is amazing! All of the serial killers I have interviewed have been so fascinating and so willing to talk about themselves. Serial killers are very complicated human beings with amazing stories to tell about their lives, their crimes and how they evolved. I always knew that I had so much to learn from them, so I was like a sponge. I wanted to listen and learn. My role was never to justify what they did, or minimize what they did. It was to learn more about them and the full extent of their damage. Q: On TV the serial killers always go after the profilers and sometimes kill them and their families. Does this ever happen in real life? A: I am not aware of a serial killer coming after a profiler and killing that person and their whole family. It does make for a great Hollywood plot though! Q: Why do you think some people are so dangerous? A: Violence and human behavior is complicated, but the vast majority of people are dangerous because they consciously choose to be. I know that is oversimplifying it, but freedom of choice cannot be emphasized enough. Obviously there are many variables that contribute to violence, but it is important to understand that most people do have control over whether or not they engage in criminal and/or violent behavior. Q: What is it about a psychopath that people don’t understand or that movies portray incorrectly? 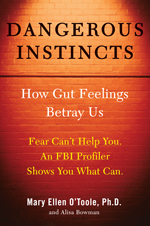 A: As I explain in Dangerous Instincts, psychopathy is a passion for me, and I have studied it for decades. Psychopathy is a personality disorder; a psychopath is a person with this personality disorder. The one aspect of psychopathy that continues to amaze me is that people think of these individuals almost like unicorns. They think they will be able to spot them because of their physical appearance. And of course this is not so. Psychopathic individuals look just like me and they look like you. Terms like “monster” or “evil” have no behavioral meaning, and their implication is that the psychopath is not a human being. Psychopaths are human beings, but they are human beings with a callous lack of guilt for their actions and a stunning lack of empathy for their victims. Q: Do you think your job affected you? A: I used to say that it didn’t affect me but, in reality, I think it did. Most people will never see the violence that I saw or heard, and those things do leave a lasting impression. I keep things inside more, and I am more private with my feelings and emotions than most people. Q: What personality traits do you think really helped you as profiler? A: I can listen to someone talk for hours or days. That was a definite asset in my work. Thanks to my background and upbringing, I have a great sense of humor, and I relied on that every day of my life as an FBI agent to get through some rough times. Q: Did you ever have to shoot anyone while on the job? A: Fortunately I never had to use deadly force. I always carried a gun and was trained to use it if I needed to. But despite many arrests, search warrants and dangerous interviews, I never had to shoot someone and I am very grateful about that. Q: Is there a victim (or victims) that you still find yourself thinking about, years later? Or an offender? A: I think about many of the victims whose cases I worked on. I really cared about my victims and their families. I put my heart and soul into my work, so I carry all of their memories with me. * What if they had been born into a different family? * What if there had been early intervention? * What if the red flags had been seen early on and acted upon? * What if this person had decided to go a different direction in life? What would have become of him or her?